Major Manana Kurdadze and Sergeant Nana Tskhadadze recall their colleague Zurab Begiashvili, who died in the 2008 August war. Both women served as military doctors during the war. All photos by Bach Adamia for Chai Khana. Reused with permission. 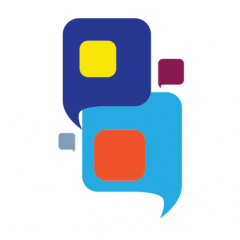 The following is a version of a partner post by Global Voices’ partner Chai-Khana.org. Text and photos by Bacho Adamia. Georgian doctor Nana Tskhadadze is no stranger to war. The 44-year-old sergeant served as a doctor in Iraq and was on the front lines in Tskhinvali during the 2008 August war between Russia and Georgia. But despite the doctor’s experience, for many Georgians, Tskhadadze’s gender makes her an unlikely soldier. Gender stereotypes are strong in Georgia, where many parents still raise little boys to think they have to be strong and brave and little girls should be kind and caring. A small minority of women, like Tskhadadze, are bucking those traditions, however. Tskhadadze did not grow up dreaming of the military. As a young girl in the village of Sviri, in Georgia’s southern Samtskhe-Javakheti region, she dreamed of becoming a doctor. After graduating from Tbilisi State Medical University, she worked as part of the school’s faculty for five years. Eventually, however, she decided to follow in the footsteps of her brother and cousins and join the army. In the beginning of her career, Tskhadadze served in the Kodjori Brigade as the head of the pharmacy. After that she worked as a military doctor for six years. Eventually she was deployed to Iraq, where 2,800 Georgian troops ended up serving, mostly in the capital Baghdad. Memories of the August 2008 war stir deep emotions for military doctors, who witnessed the death and suffering soldiers experienced on the frontline. “During a war, anything can happen. I could have been captured,” Dr. Nana Tskhadadze (left) says. When the August 2008 war broke out, Georgia quickly withdrew its forces from Iraq. Tskhadadze was sent to Tskhinvali, the de-facto frontline where centrally administered Georgia meets with the Russia-backed breakaway territory of South Ossetia. When she heard about her deployment, she felt she had more responsibility than her male colleagues. “When they told us that war had started, I began thinking about what could happen. I knew that, as a woman, I had more responsibility. In a war, anything is possible and I might be captured,” she recalls, adding that her capture would be “shameful” for both her family and the country. Moreover, unlike her male colleagues, Tskhadadze felt she had to hide her deployment from her parents, out of concern for their feelings. 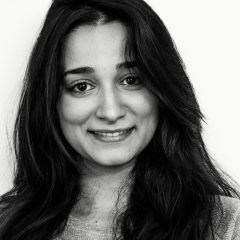 When she was sent to Tskhinvali, she lied to her parents, telling them she was being posted to a military hospital in Georgia's capital, Tbilisi. 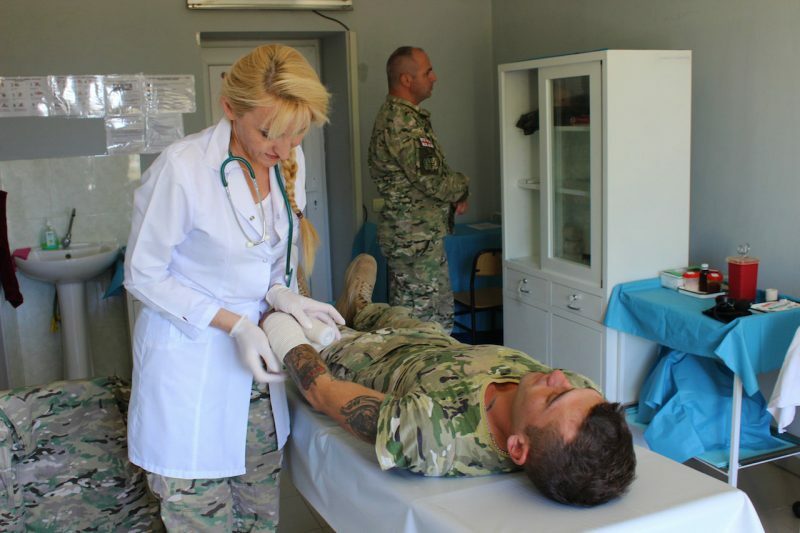 Sergeant Tskhadadze bandages the arm of a soldier at Vaziani Base. Ten years later, Tskhadadze can still recall the sound of the bombs and the ferocious heat on the frontline when it came under attack. “We followed the medical team. There were four of us — two men and two women. We had to defend ourselves because they [Russian troops] opened fired from a deserted house. We helped our soldiers,” she says. The situation deteriorated once Russian forces began an aerial bombardment. “It was a real hell in the city. They were shooting from everywhere. Soldiers arranged a defence line so we could reach the wounded. On the way back, we had to do the same for them and they helped us rescue the wounded,” Tskhadadze says, adding that the men had felt encouraged when they saw their female colleagues on the frontline. Dr. Nana Tskhadadze started as a civilian doctor but eventually joined the army, like her brother and cousins. She and other women in the military are challenging widely held gender stereotypes. As they were heading away from the fighting, there was an explosion in the forest. Tskhadadze can remember the calls for help and grabbing her bag to help a soldier who had broken his leg. “I stopped the bleeding and called for others to bring the stretcher. Right then the sky went orange. A wave shook me and I saw soldiers flying through the air. I fell over,” she says. When she came to, everything was quiet and she saw dead bodies around her. At some point, however, she realized that other Georgian soldiers were arriving on the scene to rescue them. “They helped me. These scenes are etched in my memory,” she says. Tskhadadze was taken to the Gori hospital with the other wounded soldiers. The trip to the hospital was the first time in her military career that she had felt afraid, she says. “I was seriously injured but what I had witnessed was even worse than the physical pain. Since I survived that, I understood that I must continue living. A year later, I put my uniform back on and returned to the army,” Tskhadadze says. Major Manana Kurdadze stands with soldiers in front of the sick ward named in honor of Lieutenant Zurab Begiashvili. 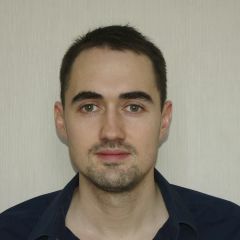 Begiashvili died during the 2008 war. Kurdadze served as a doctor during the war and her own son was injured in the fighting. 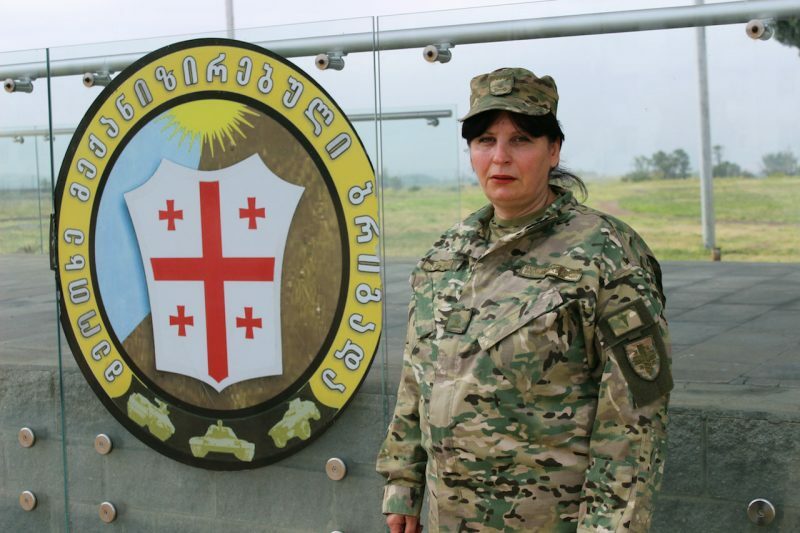 Doctor Manana Kurdadze, 53, a major in the army, has been defending Georgia for over two decades. She is known as the “brigade’s mother” in her unit. For the soldiers, Kurdadze is not only a doctor but also a friend, someone they can consult when they have problems. “When you are a doctor you have a big responsibility but the biggest responsibility is to defend the peace. Serving the soldiers and serving the peace brings me happiness. I thank God that I can help our military,” says Kurdadze. Like Tskhadadze, Kurdadze gets emotional when she remembers the 2008 war. 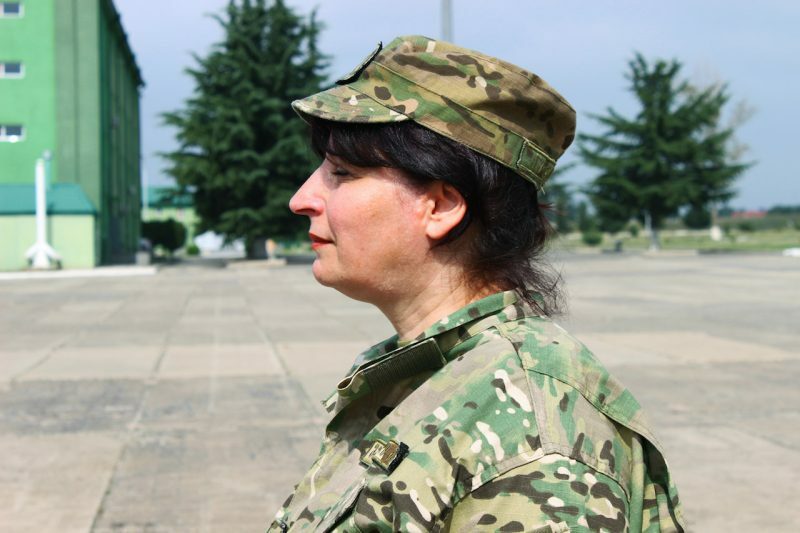 Dr. Manana Kurdadze, 53, is known as the mother of her brigade. “When the air attack began, my friends and I were expecting something horrible to happen. They say that in those moments, you see your whole life in front of your eyes. But I didn’t see my life. 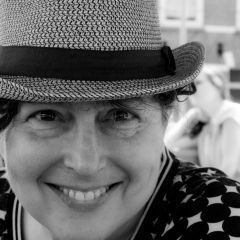 I was just begging God for a miracle and for all of us to survive,” she recalls. 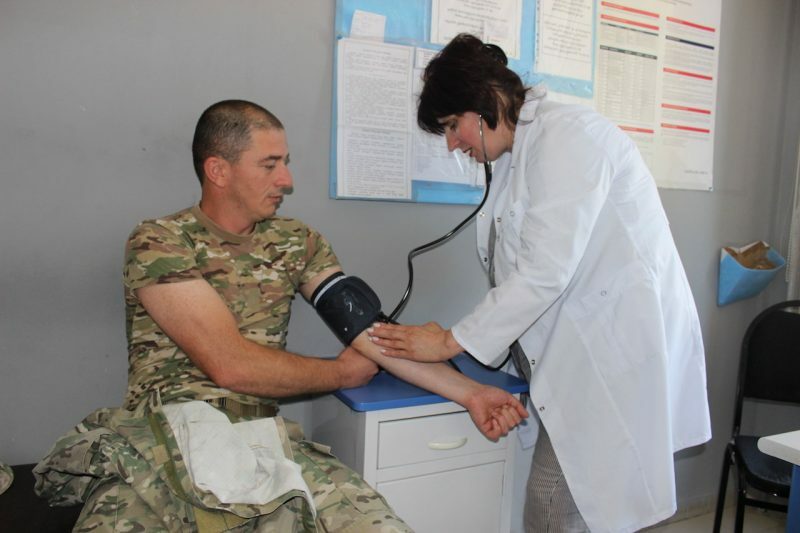 Major Manana Kurdadze measures a soldier’s blood pressure at Vaziani Base. Kurdadze, who has two children, says that her family’s support means a lot to her. The scariest moment in the 2008 war for her was not from her time on the frontline, but rather when she learned her own son had been injured in battle. Manana Kurdadze is set to retire soon and she finds it difficult to imagine her life outside the military. Kurdadze believes that women and mothers have a special role in maintaining peace. Manana Kurdadze believes that military service builds inner strength. Today, she is now facing a new challenge: retirement. For more articles like this, see Chai Khana's special coverage section The Peace Builders.